The Messenger of Allah (pbuh) said, “He who performs the Wudu’ perfectly (i.e., according to Sunnah), his sins will leave from his body, even from under his nails.” [Muslim]. What is Istikhara and how is it performed correctly? This is a very common question and quite rightly so. Will I see a dream? Some colours? A Sign? Or nothing and what if I see nothing? Did I not perform it correctly! How many times do I need to do an Istikhara? Istikhara as recommended by the Prophet (pbuh) is such an amazing blessing and a direct answer from Allah. Its a way to get guidance direct from our creator? Istikhara, in reality, means “to seek goodness from Allah”. Does Istikhara require lots of preparation or is it something I can do daily? Well, its not like that. Istikhara can be performed every day and even in the daytime. I know some people who do Istikhara with most of their prayers. Except for after Fajr and Asr when sujood (sajda) is forbidden. Also Istikhara can be performed for life’s small decisions, big decisions and even for general guidance in your life. Allah has made our lives easy. Alhamdulilah. Seeing Dreams: You don’t have to see a dream but of course you may see a dream. A good dream is a positive sign and a bad dream is a sign of warning regarding that matter of your life in general (if you are doing a non specific istikhara). Dreams are a great blessing from Allah. Prophet (peace and blessings of Allaah be upon him) said: “True dreams are one of the forty-six parts of Prophethood.” (al-Bukhaari, 6472; Muslim, 4201)This means that good dreams and warnings in your dream are a direct source of information and guidance from Allah – SubhanAllah If you don’t see a dream, it is not an issue. It is recommended that you should continue your istikhara for 7 days if you have not got your answer. Keep asking Allah to show you a dream and if you don’t see a dream at all you will still be guided by Allah through a change in circumstances or a change in your heart and your feelings towards that thing. InshAllah. We have been instructed by the Prophet Sallallahu Alayhi Wa Sallam to perform the Istikhara prayer whenever we make decisions in our life, especially when we make some major decisions in life. 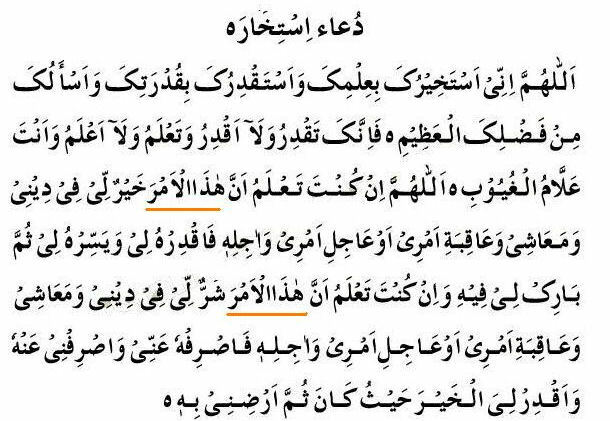 Therefore, we should always make an effort to perform this prayer of Istikhara, whether we see it as a way in receiving guidance or whether we perform it as a supplication dua. One of our weakness as Muslims nowadays is that we have lost our link with our creator Allah (S.W.T) . If we get close to Allah we don’t need anyone. Ask Allah for absolutely anything. If its good for us it will happen inshAllah and if bad for us may Allah keep it away from us. When it comes to dreams ask Allah to show you a dream or a clear sign and believe me its works. You will start seeing dreams insha Allah if you ask Allah from your heart you will definitely find guidance for your dilemma. Dua is the weapon of the believer. The following Dua’s can be very effective in relieving our problems Please remember real action towards changing your situation (if it’s in your control) is part of your Dua. For example if we pray and pray to Allah “ Ya Allah please give me excellent marks in my exam “ No matter how much you make dua, you will not get good marks in your exam unless you study and work hard. This is because a part of the dua itself is the action that needs to be taken. Abu Hurairah (May Allah be pleased with him) reported: The Messenger of Allah (PBUH) said, “There are two statements that are light for the tongue to remember, heavy in the Scales and are dear to the Merciful: `Subhan-Allahi wa bihamdihi, Subhan-Allahil-Azim [Glory be to Allah and His is the praise, (and) Allah, the Greatest is free from imperfection)’.” [Al-Bukhari and Muslim]. “Allahumma inni a’udhu bika min adhabil-qabri, wa a’udhu bika min fitnatil-masihid-dajjal, wa a’udhu bika min fitnatil-mahya wa fitnatil-mamati. Allahumma inni a’udhu bika minal-ma thami wal-maghrami. I seek forgiveness from Allah, the Almighty, there is no God but He. He is self-Existent, the Eternal and I return to Him. O Allah, I beseech You for sustenance – abundant, good and lawful-from the “sustenance” You own. 9. Dua at Times of Grief. Prophet (saw) said ” if any servant of Allah afflicted with distress or grief makes this dua, his dua will be accepted”….. I seek protection for u in the perfect words of Allah from every devil and evry beast and from every envious blameworthy eye. 11. At Times of Saying Something Important. Rabee shrah lee sadri wa yasir li amri wah lul ooq da tum mil lisaani yafqahu qowly. O Allah i hope for your mercy so give me not over to myself for as little as wink of an eye, and set right all my affairs, there is no God but you. One of the most famous prayers of Prophet Mohammed (saw) is known as the ‘ Prayer of light ‘ …..
Dua’s can change our life, our outlook, and our fate. It is the most potent weapon of a believer. Once Prophet Muhammad Sall-Allahu alayhi wa sallam passed by a people who were suffering from some affliction. “Why don’t they make dua (pray ) to Allah for protection,” he said. With all the suffering and disasters Muslims are facing in various parts of the world, the question can be directed to all of us today. It is not that we have forgotten dua completely; we refer to it regularly. But, our ideas and practice regarding dua have become distorted. Often it is reduced to the level of a ritual. Generally it is considered when all our efforts have failed — an act of last resort. It is belittled through actions and sometimes even with words. Is it any wonder that today mostly a mention of Dua is meant to indicate the hopelessness of a situation. Dua also requires action on our part. For example simple to ask Allah to give you good grades in an example will not work as the prerequisite is for you to study hard. In the same way changing a situation to the best of our ability for the things Allah has given us control over is essential alongside making Dua. For example your son or daughter or going off the right path. It is not sufficient enough to just make Dua, O Allah make my children pious, action is required in guiding them to the right path and with sincere Dua on top of that inshAllah you will see excellent results. Dua is our most potent weapon in all struggles of life as well as in jihad in the battlefield. During the battle of Badr, the Prophet Muhammad Sall-Allahu alayhi wa sallam stood up all night in prayer seeking Allah’s help in the battle between unequal armies that would follow the next day. In the decisive battles against the crusaders, Sultan Salatuddin Ayyubi was busy day and night. His days were devoted to Jihad. His nights were spent making dua, crying, seeking Allah’s help. This has been the practice of all true mujahideen. We should make it a point to make dua for all things big and small. Nothing is too big for Whom we are asking from; nothing is too small for the one who is asking. That is why we have been taught to ask Allah when we need something as small as shoelaces. We should ask as a beggar, as a destitute person, for that is what we in reality are in relationship to Allah. At the same time we should ask with great hope and conviction that we shall be granted our prayers. We should remember the Hadith: “There is nothing more dear to Allah than a servant making dua to Him.” On the other hand, a prayer lacking concentration and conviction is no prayer at all. We should ask for all of our needs: those related to this world as well as those related to the Hereafter. Those who only concentrate on the former are, in effect, announcing that they don’t care for their life in the permanent abode. They should blame nobody but themselves for the total ruin in that world that Qur’an assures us awaits them. Those who only concentrate on the later are also showing lack of balance, for we need Allah’s help to lead a good life here as well.